You’ll probably blast trails with the 800 Rush Pro-S, but it’s perfectly amenable to slow action winding along in the backcountry. Polaris’ rider-centric 2018 800 Rush Pro-S is a stand-apart trail icon. 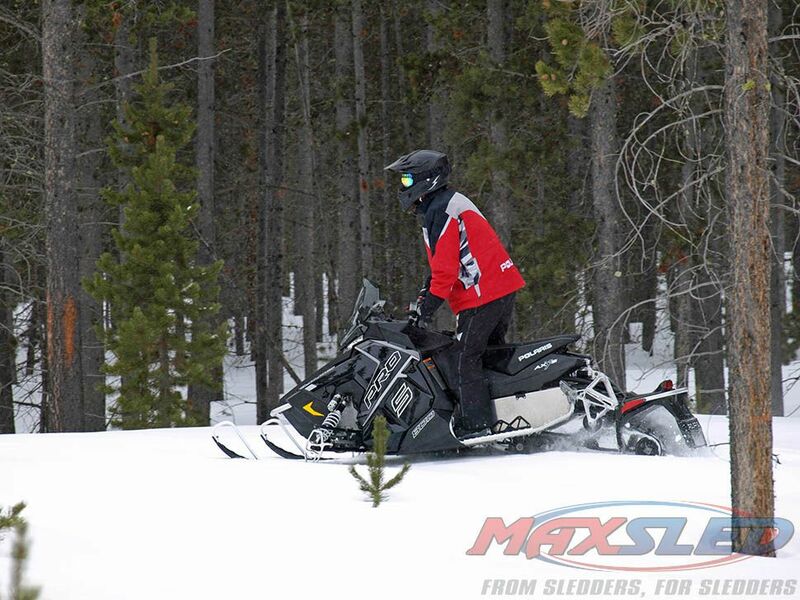 The 2010 Rush with its Pro-Ride monoshock rear suspension set Polaris’ performance trail sleds apart from the crowd. An enduring concept it’s evolved into the Pro-XC seen in the current 2018 Polaris 800 Rush Pro-S and still differentiates Polaris from its competition in serious trail and off-trail segments. In its eight seasons, the Rush has evolved from Pro-Ride up to the current Pro-XC with changes in structural componentry, geometry and tuning capabilities. That Pro-XC that sits under today’s evolved AXYS chassis draws its lineage straight from the 2010 Rush. The Pro-XC suspension that integrates with the new AXYS chassis may appear similar to the older design but actually features 93 percent new parts, including a carbon-fiber over-structure and all-new rider positioning. Polaris’ concept of ride stability and control continues but it does it via more modern materials and from lessons learned in eight years of serious engineering and consumer rider feedback. The basic rear suspension design retains the use of an adjustable external shock controlling a “split” mono-shock style rearmost assembly. From the very first Rush to now, that rear shock has been repositioned from a more upward angle to a flatter plane. 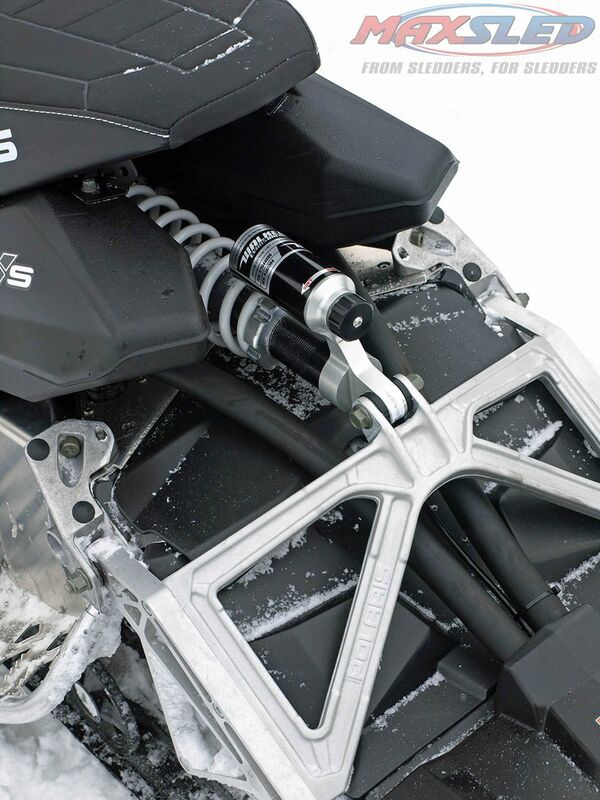 The rear assembly of the newest Pro-XC is different from the original as the progressive rate design now features lighter forged aluminum pieces with totally recalibrated and repositioned geometry to match what Polaris calls its “Rider Balanced Control.” Slip forward to improve ski bite. Slide back to add traction. It’s all in the Polaris definition of controlling weight transfer to get the skis light for holeshots. The new Rush and its AXYS design puts the rider in a more balanced ride position than the older design, with hands moved forward 4.5-inches, feet forward 2-inches, knees and seat 4.5-inches to the front as well. To achieve this, Polaris engineers reworked the Pro-XC front suspension to complement the advancements of the Pro-XC rear unit. 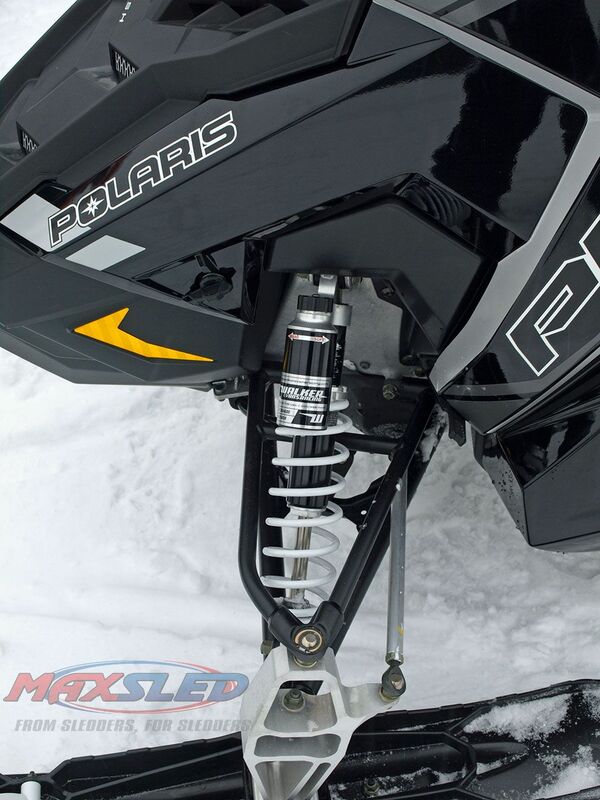 Exclusive to Polaris compression adjustable Walker Evans shocks maintain ride control of the front suspension’s 9.3-inches of travel. As you’d expect, exclusive to Polaris Walker Evans shocks maintain ride control with compression adjustable shocks front and rear. The front suspension offers up to 9.3-inches of travel with 13.6-inches of travel available at the rear. What we recall impressing us as much about the 2010 Rush as its then-new rear suspension was how much the riding “feel” replicated Ski-Doo’s REV series. Sitting behind the low Rush windscreen in the rider-forward position provided an uncanny sense of familiarity with the REV of that day. Why not? Ski-Doo had hit the snowmobiling equivalent of a home run with the REV, forever changing how snowmobilers interacted with their sled. Because no one else had the REV with its new ride-forward ergonomics, every other sled maker bad-mouthed the REV as non-traditional while they attempted to answer Ski-Doo’s popular new design and get their own ride-forward model to the snow. 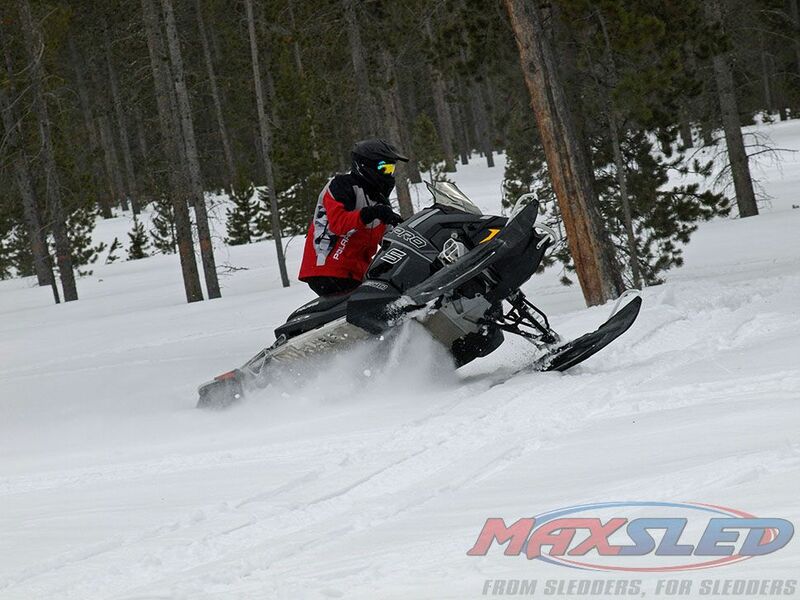 This was a period of innovation as sled makers brought out new suspensions, revised existing drive systems, added more choices in customization and worked diligently at giving snowmobilers enhanced ergonomics. Once the new ride-forward platforms appeared, the sled makers brought forward new concepts of on-sled comfort with more ergonomic handlebars, heated seats, improved controls to adjust handlebar and throttle thumb warmth and improvements in reverse gear, shock adjustments and so on. You can see those efforts continuing with flip lever shock adjusters, push buttons for mechanical and electronic reverse. Still, though, the main sense of a sled is how it “feels” on the trail. That was the purpose of creating the mono-shock rear suspension, wasn’t it? 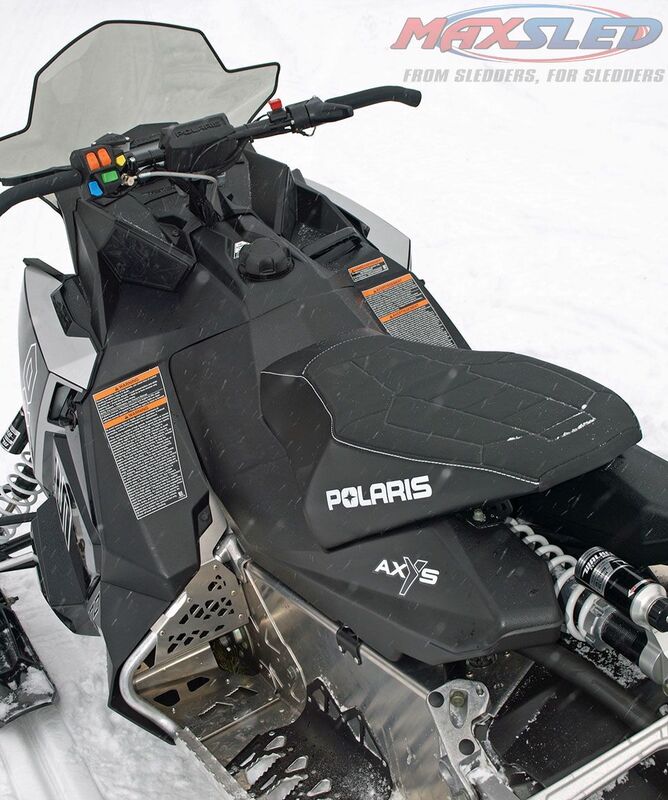 Plus, Polaris needed its own rMotion type design to capture snowmobiler interest. It couldn’t be a rehash of someone else’s idea, no matter how much better it might be. No, the Polaris design needed to stand apart and make a statement. The Pro-Ride and now the Pro-XC did — and does. Intended for groomed and nearly groomed trails, the Rush with is 120-inch Ripsaw II track can dance through deep off trail snows as well. We had a first-year Rush back in 2010 and found it handled virtually every trail condition as intended. It was very good at absorbing those long suspension sucking risers and took the jiggle out of trail stutters. But, it seemed a bit unready for the mile after mile of deep ditch banging common to northwestern Minnesota. Moving to model year 2018, we see the evolution of the Rush as accomplished in virtually every condition. Of course, the most serious bangers among us will move to the racer-based XCR versions of the Rush and Switchback. Whichever way you go, the sleds will be similar in features, but you’ll pay about $1,300 more for the 800 and its added 30-something horses. The Polaris-engineered and built 800 was created in concert with the AXYS chassis, features an electronic fuel pump, three-stage electronically controlled exhaust valves, V-Force reed induction, a lightweight crankshaft and a myriad of other performance tweaks to create smooth and powerful operation from drive off to full-on top speed. All of the 800s performance works through a proprietary Polaris P85 drive clutch and Team lightweight driven. The AXYS performance seat uses a grippy top material to keep your nylon-clad bottom in place until you’re ready to slip from the wide comfort area forward along the tapered sides as you set up for a turn. Just as Ski-Doo continued to fine-tune the ergonomics of the REV, we’ve seen Polaris continually update its rider ergoes as well. The AXYS performance seat incorporates a grippy top material to keep your nylon-clad bottom in place until you’re ready to slip from the wide comfort area forward along the tapered sides as you set up for a turn. Getting into “ready” position for hustling deep moguls is easy and natural. The handlebar’s evolution affords comfortable curvature for control to carry speed through corners — right or left! And, of course, Polaris keeps the Rush rider-friendly with a fully featured gauge, revised left hand controls to more easily reach and control the heater elements for the handlebar and throttle lever. You can add a catalog full of storage options or windscreens. Fitted with a Ripsaw II 120-inch length track, the Rush is quick and easy to flick through a series of woodland corners. The Pro-Steer plastic skis have ample bite and let you ride as hard or as easy as you want. Ride it for hundreds of miles in a day, or join your hard riding buddies for an aggressive afternoon on fresh trails. The Rush is one of those sleds that is truly tuned to your needs as a rider. In Polaris terms, the Rush is rider centric for comfort, control and, with the 800, acceleration.